7.5 miles on the PRT this am. 51* start/58* end, Little or no wind in full sunshine. 1o days 22 hours till Boston! Took a rest day strolling through the Crossroads of the West Gun Show. Oh ya, lots of fun things that go boom in the night! went out to run 8 on the Mt Rd but ended with 9. 51 *, partly sunny, 13 mph wind, 55% humidity....7 days 11 hours and is all done but the crying! 4 big last miles on the PRT, 33*, 9 mph wind, snowing during my run. Rain early...then remaining cloudy with thundershowers developing in the afternoon. High near 65F. Winds SW at 15 to 25 mph. Chance of rain 90%. Cloudy skies early will become partly cloudy later at night. Low near 45F. Winds WNW at 15 to 25 mph. Ok, ok, ok, it was just a fun run at the 123rd Boston Marathon '19 that accomplished all of my pre-stated goals? First and foremost I decided that I would run Boston as a mental, physical and spiritual check on my progress in the three areas listed in this sentence and then take what I've gleaned to the Huntsville "Full Monte" marathon in September and get a double "BQ" for 2020 & 2021. Well I learned that the intensive physical fitness program I have been engaged with for the past year and a half has yielded benefits beyond my wildest imagination. So I will continue with my program! As for my mental attitude, I have a renewed passion for all things and the great spirit to carry on with what I started about 21 years ago, that being; "Running Marathons"! So I will try to keep this recap of my 14th trip to the "Bean Town" Marathon and my 60th Marathon ever short and sweet. All and all it was a fabulous time in Boston for the 123rd running of the Boston Marathon. My good friend Troy and I got into town on Saturday morning too late to run the Boston 5K because of airline delays so we went and tried to get into the expo and found it almost impossible to get into because of the extremely long lines caused by the added levels of security so we went to a Red Sox game Fenway Park, too bad the Red Sox lost. After the game we went back past the Expo and there were still long lines at the entrance. The next morning, Sunday, we returned to the Expo where we entered rather quickly, found our way to the Bib Number, Shirt and poster pickup and filtered down to the Expo, which was huge again as usual. After a few hours at the Expo we went to the Old South Church for the "Blessing of the Athletes'', such a beautiful old church! Then it was off to the room where I got off my feet for a few minutes before heading out to the government center for the Pre-race dinner, The BAA does such a fine job setting this event up and making it run so smoothly, and then again back to the room to make all the final preparations for Marathon Monday! 5:am Marathon Monday morning it was raining and winding like nobodys business and I was getting worried that this marathon would turn out to be like last years nightmare! But as the morning progressed and I was leaving the room at 8:30 am to go catch my bus to Hopkinton the rain turned into sprinkles and the wind slowed considerably. Upon arriving at Hopkinton at the Athletes Village the sprinkles had all but subsided and the wind continued but at a lower rate of speed. The saving grace in all of this weather stuff was the fact that it was about 58*. Now I found myself in a crowd of runners walking down the long cattle chute route to the corrals for the start of the 3rd & 4th wave runners. The BAA had decided to wave off the waiting times between waves and start them as soon as possible which caused a lot of confusion among the runners...As I joined the other runners in this mixed up rolling start I found myself rushed and not able to do much of a pre-race stretch or even discard any unwanted clothing or gear, I just had to go with the flow and deal with it on the move. As I started running I continued to remind myself of my plan and to execute it flawlessly. I was off like a herd of turtles doing my regular 3 to 5 mile slower pace at the start of the race, then I began to slowly increase my speed. I made my first very brief stop/slow down at the two mile mark where the bikers at the biker bar had set up a beer hydration station where I had a small cup of beer and was on my way with a bunch of high fives and cheers from the bikers! At this point in the race, about mile 7, it had quit raining and sprinkling and the wind was squarely at my back and the temperature was about 60*. I noticed a Blue Temple of Doom 0n my left and took a very brief stop for what you do in a Blue Temple of Doom and to discard unneeded clothing and got myself back on the road again. I found my running style to be very comfortable and was not suffering from any of my prior aliments and decided to again continue running my plan without fault to the finish line. My plan was to run this Boston Marathon without aggravating any of my previous injuries to be sure that my therapy worked. At this point it seemed to be right on target. I settled in to a comfortable pace and had a great time running the marathon. From mile 7 to about 17 the sun was out and the temps rose to about 70* which really effected a lot of the runners, as I noticed many drop out for medical attention. I continued to run and interact with the abundant crowds that lined the marathon route on Patriots Day in MA, all while taking in the points of interest along the route. Somewhere in here it started to rain, get colder and the winds picked up. At mile 16 the Newton Killer Chain Hills began which really didn't make much of a difference in my running. At mile 19 or there about the Hash Hound Harriers, the Drinking club with a running problem, had a beer line set up and I again had a small beer to go and I went up and over the fabled Heart Break Hill without missing a step. Then at the top of Heart Break it was the beginning of the down hill portion of the marathon into Boston and the finish line too which I continued to run in the rain, cold and wind and again enjoying all the fans and spectators along the road cheering all the runners to a successful finish. 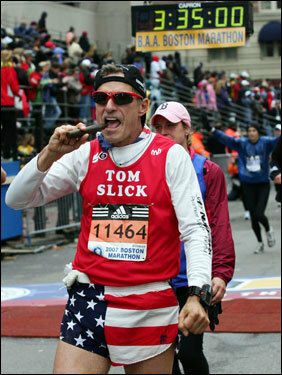 What else can I say, except that "I Planed My Race and I Raced My Plan" to a successful 14th personal running of the Boston Marathon and a pathway to enjoying (hopefully) many more marathons including "The Boston"!!!!! As noted above I ran this one in 4:32:25 and I loved every minute of it.........see ya all at the "Full Monte" in September! 4 easy recovery miles this am.....life is good! Had a " I completed the Boston Marathon Party" at our regular Boys Night Out and decided to forgo any running or workouts Saturday........Back after it Sunday!!! !